The collaborative robots are used in three different applications. The first robot tends a complete machine cycle; it picks and places “book frames” that hold pieces to be molded into the injection molding machine, transports the units to a trimming fixture, places the part in front of an operator for further handling, and finally pushes a button to activate the cycle again. “We were having trouble making one good part with manual labor, let alone the various shifts tending the machine cycle differently,” says McGillivray. The second injection molding application uses a traditional cartesian robot that drops a molded piece down a slide where the UR robot picks it up and places it in a degating fixture, then palletizes the part on a table in front of the operator for inspection. Previously, the parts would fall onto a conveyor, which often damaged parts, and the operator had to catch them before they unloaded. The third robot is deployed in a kitting application. Using a vacuum gripper the UR10 picks up a “clam shell” - the bottom part of a plastic box – then it picks and places sterile wipes and saline solution into the clam shell, and pushes the loaded shell onto a conveyor. Before the UR10, Dynamic Group used six to seven employees at once to do this kit assembly application. He initially thought Dynamic Group couldn’t afford such a versatile and capable automation solution. “When I started looking, I assumed I was talking hundreds of thousands of dollars per installation. I was surprised to find that we could afford a six-axis robot and a collaborative one at that,” says McGillivray who also assumed he would need a very expensive programmer or engineer to install them. The Minneapolis injection molder is able to quickly redeploy their UR robots to completely new tasks in short order. “All the robots are on bases that we can transport around on wheels and slide from press to press and application to application. The fact that we can quickly reprogram and redeploy these robots enables us to effectively address our high mix/low volume challenge,” says McGillivray. The mobility of the UR robots is in stark contrast to traditional industrial robots that usually stay bolted down in a safety cage. The UR robots can work collaboratively right alongside Dynamic’s employees due to a built-in safety feature causing the robots to automatically stop operating when they encounter obstacles in their route. “Our employees are working directly with the robot, there is no fence in between. That’s a huge savings to us on time, needing to manufacture, and costs to manufacture those enclosures and of course floor space. We’re able to fit a lot more automation in a much smaller footprint,” says the Dynamic Group CEO. All three UR robot models (UR3, UR5 and UR10) utilize a unique patented technology to measure electrical current in the joints to determine force and movement. If the robot arm measures a force stronger than what it is programmed for (can be down to 50 Newton in UR3) it automatically stops. “I wanted to really understand how well the safety features worked on the system. When Universal Robots distributor Braas Company first showed me the robot, I asked them to pummel me with the robot, and they wrote a program that allowed me to walk in its way as it’s going back and forth. It didn’t hurt, sensed me immediately, and stopped just like I’d want it to,” says McGillivray. When the robot goes into a safety stop, the operators can quickly start the robot back up without any assistance from a programmer or an engineer by interacting with two buttons on the touch screen. Contrary to popular belief, having robots take over tasks previously handled by employees did not lead to staff layoffs at Dynamic Group. “We needed to make better use of the labor we had on hand. Instead of using our employees as labor, we needed to use their brains. That’s what Universal Robots has helped us be able to do. 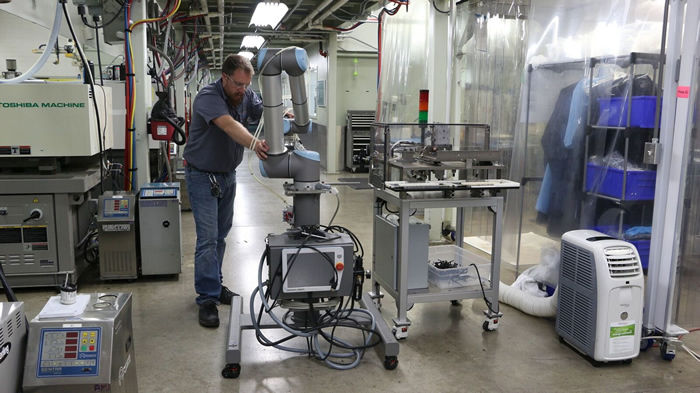 We lowered our labor content per part, and gave people better jobs,” says the injection molder who is now training employees to operate, install, and program the UR robots. McGillivray and his team are also working on getting more UR robots into their production. Next step will be installing the smaller UR3 model directly on presses. Based in Minnesota, Dynamic Group is a privately owned contract manufacturer specializing in providing complex injection molded plastic components and assemblies and high precision molds for plastic and powder. The company primarily serves the medical, electronics, and technology industries. 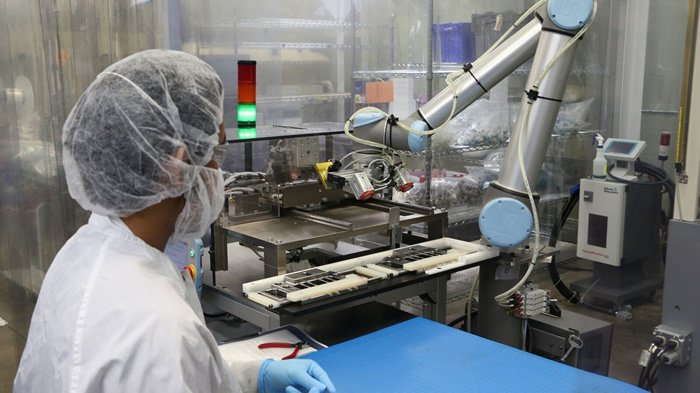 Universal Robots is the result of many years of intensive research at Denmark's successful robot cluster, which is located in Odense, Denmark. The company was co-founded in 2005 by the company’s CTO, Esben Østergaard, who wanted to make robot technology accessible to all by developing small, user-friendly, reasonably priced, flexible industrial robots that are safe to collaborate with and that on their own can be used to automate and streamline processes in the industry. The product portfolio includes the collaborative UR3, UR5 and UR10 robotic arms named after their payload in kilos. 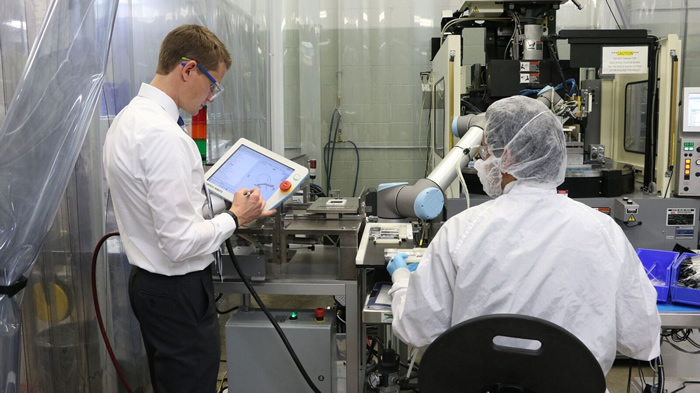 Since the first UR robot launched in December 2008, the company has experienced considerable growth with the user-friendly robots now sold in more than 50 countries worldwide. At just 195 days, the average payback period for UR robots is the fastest in the industry. The company, a part of Boston based Teradyne Inc, is headquartered in Odense and has subsidiaries and regional offices in the US, Spain, Germany, Singapore, Czech Republic, India, and China. Universal Robots has more than 200 employees worldwide. www.universal-robots.com.